Beacon of Hope | Arts and Culture | Style Weekly - Richmond, VA local news, arts, and events. Hopewell’s newly renovated theater aims to revive downtown. Scott Elmquist Hopewell’s Beacon Theatre was designed by Fred Bishop, the architect of the Byrd Theatre. Oldie stars such as cowboy Lash LaRue — who taught Harrison Ford how to crack a whip — performed there in the 1930s and ’40s. Older movie theaters often experienced similar life cycles. A few decades after their glittering opening, they descended to second- and third-run showings at lower prices to compete with multiplexes. The advent of home video also drove them out of business, with some attempting art-house or pornographic films before shuttering their doors. But if a theater is lucky, eventually it will be renovated and returned to its former glory. The long road to restoring the Beacon Theatre in Hopewell began in 1987, and is undergoing a few finishing touches. Following a soft opening in January, featuring musician and songwriter Leon Russell, the art deco theater will hold its grand opening this weekend with the Blind Boys of Alabama, Delbert McClinton and none other than Vanilla Ice. But the aim isn’t simply to have another venue in Central Virginia. Hopewell is banking that the theater will serve as a catalyst to revitalize the city’s downtown. 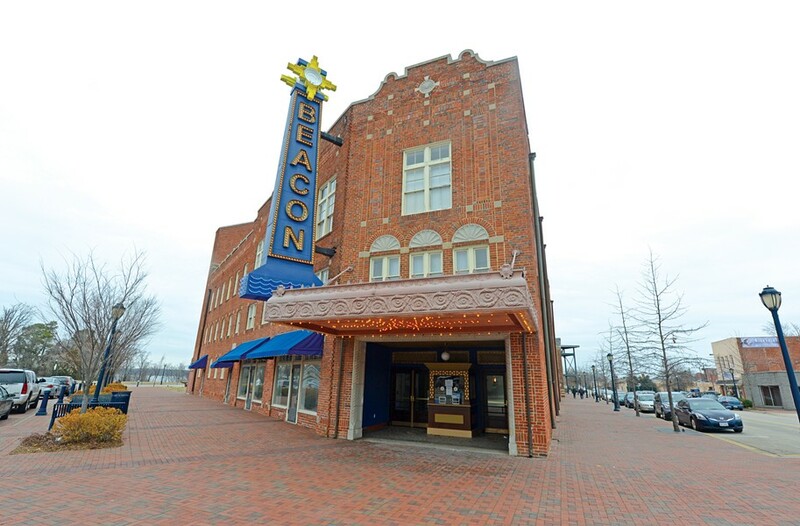 Built in 1928, the Beacon was designed by Fred Bishop, the same architect who created Richmond’s Byrd Theatre. The theaters opened less than a week apart, and share a number of design features. The Beacon was designed to transmit sound for both vaudeville acts and films, and visiting performers included burlesque dancer Sally Rand and movie cowboys, who sometimes brought their horses onstage. “We all went to the cowboy shows on Saturday,” says Jim Enochs, whose general contracting company, J.W. Enochs, oversaw the theater’s restoration. Enochs was born the same year as the Beacon and spent nearly every Saturday there as a child. A ticket and a bag of popcorn cost 25 cents. “The theater was the only place of entertainment in Hopewell back then,” he recalls. The Beacon stopped showing first-run films in 1969, and for three years it was an X-rated theater. Some people attended, others were up in arms protesting, recalls Jeanie Langford, laughing: “Everybody in town got excited about it.” She attended the theater in its pre-adult-film days, and did research for the renovation as a librarian and archivist. Through her efforts, she’s watched the theater’s slow evolution firsthand. Vanilla Ice, the Blind Boys of Alabama and Delbert McClinton will play separate shows at the Beacon Theatre in Hopewell this weekend. For information, call 446-3457 or visit thebeacontheatreva.com.